Mourning the death of the mongoose, the woman entered the house and found that her child was soundly sleeping in the cradle and also the cobra bitten to pieces by the mongoose. The woman was struck by grief that she had killed the mongoose that was like a son to her. Meanwhile, her husband returned and she began cursing him, “You miser, you didn’t heed my word and went out for alms. Self-interest is good. Too much of it will earn a man the fate of Chakradhara,” the Brahmani said. “Who is Chakradhara and what is his story?” asked the husband. 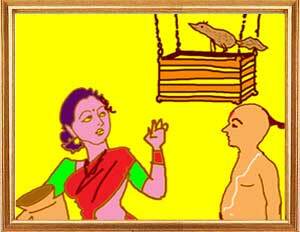 Following is his story as told by the Brahmin’s wife. Four young Brahmins were living in a city, suffering utter poverty. So, they packed their bags and set out in search of prosperity and happiness. The learned have always said that the grief-stricken man always gives up truth, relatives, mother and even motherland. It was no wonder that the four Brahmins left their place and after several sojourns reached the great city of Ujjain. They bathed in Sipra river and went to the Maha Kaleswar temple. When they emerged from the temple after the worship of Kaleswar, Bhairavananda Swami, a sadhu, greeted them. All of them prostrated before him in reverence and accompanied him to his monastery. “We are in search of prosperity. For us, it is either death or wealth. You know that adventurous people achieve their goals even if they have to sacrifice their lives. Destiny is all-powerful. Still, nothing can be achieved without human effort. Wells, tanks and ponds become full when it rains. But man too brings water out of the earth by digging deep wells. So, please show us a way to achieve our goal,” the Brahmin boys pleaded with the Swamiji. They began their journey and after some days of travel, the tablet dropped from the hand of one of the four Brahmins. They stopped there and after digging the earth, they found plenty of copper. The first Brahmin told the others that all of them could mine as much copper as they could and take it home. The others said, “What is there in copper. Let’s go ahead.” The first Brahmin said they could go if they wanted but he would go home taking all the copper he could carry. The other three continued their journey till a tablet dropped to the ground from the hand of one of the three. They dug there and found plenty of silver. The second Brahmin suggested that they should be happy with the silver they found and go home. The other two said he could take all the silver if he wanted. They would, however, continue their search for gold. The second Brahmin, happy with what he had found, took silver and went home. Now, the remaining two Brahmins trekked some more distance until a third tablet dropped. The two dug there and found gold. The third man said that gold was better than copper and silver and they must now go back because there was nothing more precious than gold. The fourth Brahmin did not agree and replied that he would continue his search. The third man took the gold and went home. It was now the turn of the fourth man. He was now tired and thirsty, and on top of it he had lost his way and began wandering aimlessly. Then he saw a man completely soaked in blood and a wheel whirring over his head like a halo. The Brahmin went near him and asked, “Sir, who are you and what is this wheel over your head? Can you show me a place where water is available?” As he finished his questions, the wheel shifted from the stranger’s head and came over the Brahmin’s head. “What is this wheel which has come over my head,” asked the Brahmin. “I have no idea. It tormented me as it is doing to you now,” the stranger said. “How long have you been bearing this hurt,” asked the Brahmin. “I have no idea. But I think it was in the reign of Lord Rama,” said the stranger. “This place is where Kubera has stored all his wealth. Those who trespass on this area will have no thirst or hunger but a lot of pain inflicted by this wheel. Only such persons who have a magic tablet like you had can come here,” said the stranger and took leave of the Brahmin. When the last Brahmin, whose name was Chakradhara, did not return, his friend Suvarnasiddhi went back following the trail left by his friend and found him bleeding and in great pain with a wheel over his head. He asked him how he got into that plight. Chakradhara told him what had happened so far. “How is that?” asked Chakradhara.